Tucked away to one side of Victoria’s Inner Harbour is Vic’s Steakhouse & Bar—and for seals like me in the area, waddling over there was a no brainer. Sometimes it’s a tough call in where I want to go and with no James around, do I go begging for fish or beef? There’s other nearby restaurants claiming to serve good meats, like Milestone’s (on the opposite side); one screwed up order there hasn’t seen me return in a long time. At Vic’s, it’s a cozy place to dine in even during the lunch hours. I did show up hoping to try the truffle fries but it was no longer offered. I asked and the waiter said the fries was more of a trial run for them and it was expensive for them to produce. I don’t blame them, especially if they’re dusting the potatoes with truffle oil to simulate the flavour. I can only hope these fries make another comeback next year and I’ll make a mad dash over there. But for today, I settled for yam fries and a burger. The waiter was kind enough to say it’ll cost more and after my order arrived, I found it was worth it. I had to quickly eat these fries though. After they cooled down, they didn’t taste as succulent as they were when hot. And a few slices probably escaped the fryer too soon (they tasted a bit starchy and undercooked). And Vic’s Burger ($9.99) has gotten better over time. The price has decreased and I piled one more item in the key to cracking the safe open to my taste buds. I went for the cheddar, bacon and jalapeño pepper. After the first bite, I found the roasted garlic aioli really tasted good over the white cheese. The soft sourdough bun tasted better than what I remembered and while my personal preference to have a nice thick patty of beef, what they served here is just fine. Even after my two reviews, dated Dec 2009 and Aug 2010, for Nexus Newspaper, Vic’s Steakhouse & Bar still remains four stars. Quality hasn’t been sacrificed in lieu of slightly lower prices. 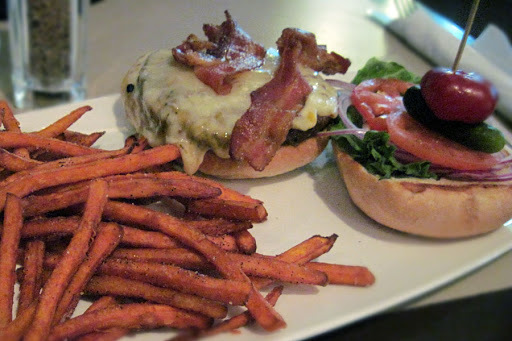 This entry was posted in Food, Reviews and tagged French Fries, Inner Harbour, Pub Food. Bookmark the permalink.